Nathan Sawaya is bringing THE ART OF THE BRICK home to NYC. Legos may be a popular toy for children, but that doesn’t mean they aren’t exciting for adults sometimes, too—especially when they’re made into fantastic exhibits like the one coming to Times Square in June. “THE ART OF THE BRICK” will be the largest-ever assembled Lego display. 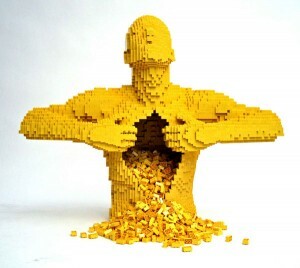 Artist Nathan Sawaya will present his critically acclaimed Lego art collection for its first time in New York City. He has already presented similar exhibitions in Singapore, Taiwan and Australia. But his more than 100 pieces for NYC’s Discovery Times Square will be brand new. The Art of the Brick at Hollywood Arts and Culture Center, 2010. Tickets for the event are be available on the Discovery Times Square website, and are priced between $14.50 and $19.50 per person.